Pig Sticking is an ancient tradition of boar hunting, usually done with long cross guarded spears. I guess this is where the Pig Sticker Bowie Knife gets its name. 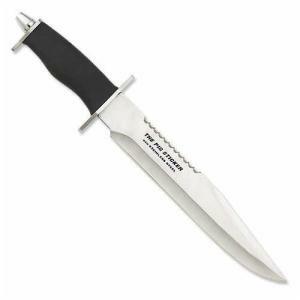 This is a long knife - 15" overall length - but about standard length for a Bowie knife. Not quite a spear, but I supposed you could hunt boars with this blade. The 10" plain edge blade is made from 440 stainless steel. It's a drop point with a false edge on top, very common in Bowie knives due to their traditional use as a close combat weapon. The sharp serrations along the spine, however, are a more modern contribution to the Bowie knife, a design feature akin to the 20th century combat knife. The rubber handle offers a solid grip. A stainless steel guard and heavy pommel round out the Pig Sticker's features. In the history of the Bowie knife, hunting and fighting with your blade have gone hand in hand. This Pig Sticker reflects this mix of design elements, but not altogether in the traditional ways. For one, it has a very short curved edge near the tip. Bowie knives were also hunting knives, and an elongated curve of the edge allows for an easier skinning of a carcass. The spine serrations and heavy-duty pommel remind me of a combat knife. I would say, whatever the design influences of this knife, this Pig Sticker is definitely intended for use and not for a collector's case.